There's a name for almost anything in the world of booze — it's (almost) all been done before. Beer and mead hybrids, cider and mead hybrids, beer and wine hybrids: at some point, probably hundreds of years before we were even born, someone tried throwing it together. But few genres of drink can claim to be coined by Stephen King. 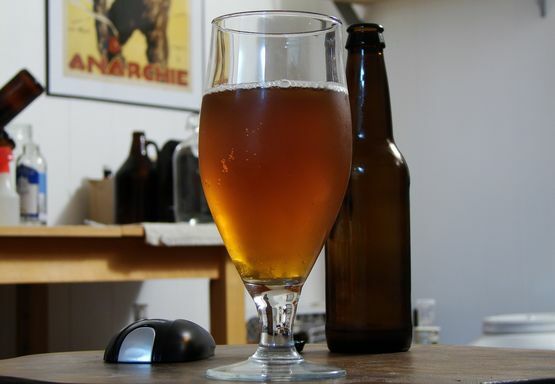 While I think it's extremely unlikely that no one throughout history thought to combine beer and cider, the hybrid somehow never earned a name until very recently, when HomeBrewTalk user Brandon O shared a basic recipe and dubbed it "Graff" — so named after after a beverage Stephen King wrote about in his Dark Tower series. A hybrid of beer and cider. In retrospect, it seems like a pretty obvious idea. The malt portion of graff adds body, head retention, and sweetness (if you're into that sort of thing). The significant cider portion means it still tastes like cider, not apple-flavored beer. Of course, being the experimental rapscallion I am (and was, even a year ago), I didn't want to make just a graff. No, a year ago, I was living in Brooklyn and wanted something funky and tart without the long waiting time of a real sour. This was my plan for a quick-turn-around funky beverage: a graff fermented with brewer's yeast, Brett B, as well as unpasteurized local cider containing who-knows-what wild yeast. I was inspired by a pear cider I had just tried that was super tart and funky, that I'm sure must have had Brett in it. Cider is already tart, so why not bump it up? Recipe-wise, this wasn't very complicated. The brewday was incredibly easy, given that the malt portion involved boiling some wheat extract for half an hour, adding an ounce of Citra hops around 10 minutes, cooling, and then dumping a few gallons of cider with the malt into a carboy. Using unpasteurized local cider was the biggest variable, but even now it's hard to gauge how much effect that had in the end. After giving this a year to age (and about four months in the bottle, from this writing), this is starting to win me over after some initial disappointment. Up until the very last week or so, I was thinking I had two individual good ideas that should have been kept separate. Graf is undoubtedly wonderful on its own, if you want a sweeter cider with some body, and Brettanomyces would definitely be a wonderful addition to straight-up cider or apfelwine. I've never tried another graff — nor have I even heard of graff being produced commercially, by anyone. So it's hard to say how this compares to 'typical' graff, or what flavors the local wild yeast might have brought out. But at the year anniversary mark, I was hoping for a lot more funk — a big, tart mark left by the Brettanomyces. It's there, and it's peeking its head out more and more with time, but as of now it's surprisingly subtle. The funk may be partly hidden by the lingering sweetness, which I had expected to ferment out more. I gave this so long in the bottle before reviewing because I just wasn't sure what would happen — would it become the tart, crisp, funky beverage I was aiming for? For months, this was oddly sweet every time I tasted it, with a syrupy, spicy flavor I couldn't quite place. At a Final Gravity of 1.006, it's drier than almost any beer I've made, but it has a stickiness to the mouthfeel that gives an impression of added richness. Possibly from the small slurry of Belgian yeast I pitched, possibly from the wild yeast, maybe from the fact that I used malt extract (as opposed to mashing grain), or maybe a combination of all those things. Sticky, sweet and rich was not what I wanted, but now that this has hit its year anniversary mark, it appears to be rounding the corner. The mouthfeel is still a little slick, but now has a tart bite that was missing before, a clear cidery crispness, and a blooming Brett funk in the nose. It doesn't feel as "bright" and alive as it should, and that holds it back, but it tastes like cider, and it tastes, finally, refreshing. I'm not sure how long "regular" cider is meant to hold up for, but with the Brettanomyces in here doing its thing, I feel like this should be good to age for a while — hopefully improving even more by its second anniversary. To that end, I don't plan to drink this one very fast — maybe a bottle per month until it seems like it's plateaued. But for now, my advice to anyone else attempting a funky Brett graff: don't use extract, and if you do, don't use much. Ideally, do a small mini-mash and mash low, for highly fermentable wort. In my opinion, Brett isn't the monster attenuator its reputation might lead you to believe — except in certain circumstances. But if you're just making a regular cider, go ahead, definitely toss some Brett in there. Or, what the hell, grab some unpasteurized cider and let it ferment. It's fun to just shake the dice and see what happens. As with many of my early experiments, the results might not always hit the bullseye, but they're at least interesting, and educational. Would you use Citra again? Good question. If for some reason I had extra Citra sitting around (which is why I used it the first time), I guess, sure. But Citra can obviously be pretty hard to come by, and I don't think it really had much impact on the flavor. Not after aging this for a year, and with Brett in there re-arranging flavor compounds. I think an ounce (maybe two) of any fruity American hop would do fine. Great write up! It's my understanding that attenuation with Brett will be similar to Sach unless it is in a mixed culture with Pedio & Lacto. Maybe including some other bugs would help reduce sweetness? Yeah, absolutely. In my experience, that's definitely the case, but I still see a lot of talk on brewing forums about how Brett "chews through everything." When I made this a year ago, I wasn't sure to what extent that would be true. Unless it's mixed with bugs, I think Brett just means you'll hit 80 - 85% attenuation regardless of the Sacc strain you're using it with. No big deal if you give it a few months to make sure it's done, but I don't think it will eat "literally" everything without the bugs help.